Renée's recitals don't happen nearly enough, especially in New York City. So we were compelled to travel north to Boston to catch the act. It was well worth the adventure. She talked about it being the last recital of the tour, about the Kander song and the Previn song being written for her and about getting to visit Richard Strauss' home last year. Symphony Hall was mostly full and very appreciative. She sounded extraordinarily loud but I don't usually sit that close or maybe it was the angle. It was all gorgeous, wonderful and fun and exactly what I expected it should be, made even sweeter because I was there with dearest friends whom I love. She did a signing after, so we stopped by to say hello. She's absolutely wonderful. I don't think I'll see her perform live again until possibly October when she does Der Rosenkavalier at the Met, which isn't soon enough. I wish there were more recitals - they just don't happen nearly enough. 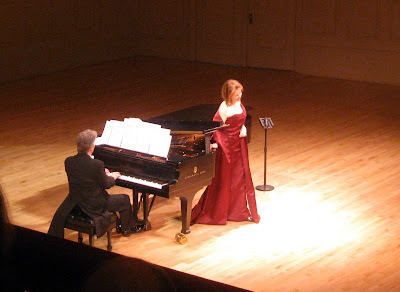 And "Ier dalla fabbrica," from Riccardo Zandonai's Conchita that will be on her new Verismo cd this fall. Sad face - it says the video isn't available. Another sad face that we have to wait until October to see her again... It was super awesome though! Patience...the video is still processing. And yes, big sad face for a wait. Her voice is soooo sultry in the lower register. I continue to remind myself how fascnating it must be to live in such a metropolis where on any given night of the week, one may go out for the evening and catch almost any form of entertainment they desire. I also am ingratiated to you for your reports on all of the said entertainment that you see. Blogging would definitely far less enjoyable without your frequent posts to enlighten me on some of the best performances in the world and to enliven this sometimes dull life that I currently enjoy. If you decide that Renee's performances are too much to do without until October, I would suggest that you take a European vacation for a couple of weeks to see her in the central part of that continent over the summer. It is also a perfect excuse to experience some of the greatest dining in the world, which is another thing for which you have a fancy. Thanks for this - I LOVE it!